New gift shop software offer released | Tower Blog | A blog about smart POS software for independent small businesses. We have used the Melbourne Gift Fair this weekend as an opportunity to refresh our gift shop software offer. Click here for a larger copy of the pricing flyer which forms part of our inquiry kit. This hardware and software package is eligible for the tax break (investment allowance) from the federal government as long as the business turns over less than $2 million annually. 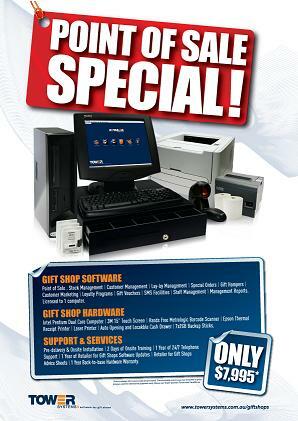 The gift shop package includes fast current-standard hardware (computer, hands-free scanner, receipt printer, cash drawer, laser printer and USB sticks) as well as our specialist POS software and on site training. The package is backed by our 24/7 support service, free access to our online training academy – Tower users have the opportunity to keep learning long after the system is installed – plus access to our user meetings which we run around the country. The software included in the package handles traditional POS functions plus lay-by, customer loyalty program, marketing tools, business performance reporting, stock management and reordering, postcode tracking and many other functions our gift shop community is finding useful.